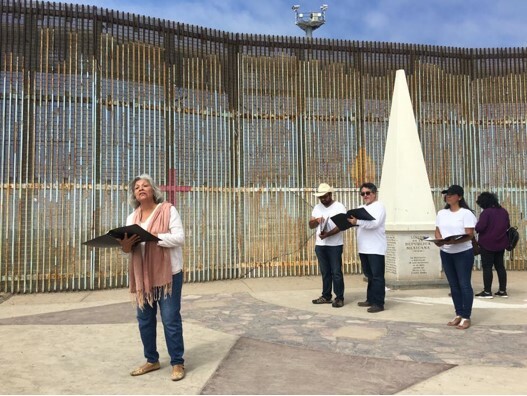 Reading of Letters from the Wall by Dave Rivas at the US/Mexican Border in Playas de Tijuana, B.C. Mexico, for the Bi-National Theater and Art Festival 2017. Left to right; Sylvia Enrique, Rick Zazueta, Dave Rivas, Mila Daniels. Photo: Enrique Chiu. This article is part of the Creating Place project. View the full multimedia collection here. The effort of creating space for me as a disabled artist in San Diego and Tijuana has been a challenge. The San Diego/Tijuana border region has been known to be very conservative as well as competitive in the arts since I can remember. At the end of 2012, arriving home from a successful tour of a play I had worked on in collaboration with two theater colleagues, I was faced with the question, “So what do I do now?” You see from 2010 to 2012, I had made connections all over the US with many people in the arts field and was given the opportunity to write and perform a play in three cities around the country through two grants. 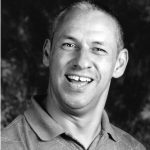 I was also able to begin, in my own way, defining the capabilities and strengths of disabled artists around conversations that were arising. To have the opportunity to sit at these tables and have my voice heard was very honorable. Unfortunately, I found myself returning home with all this enthusiasm not knowing where or how to channel it. For the past 12 years the alternative art scene in San Diego had taken a huge hit. Competition between art organizations as well as individual artists for the limited number of resources/funds given, started to impact the arts dynamic in my city. The small theaters whom I worked with/out of and where I had built my trajectory became extinct. Pondering on this situation, I concluded that something needed to be done. 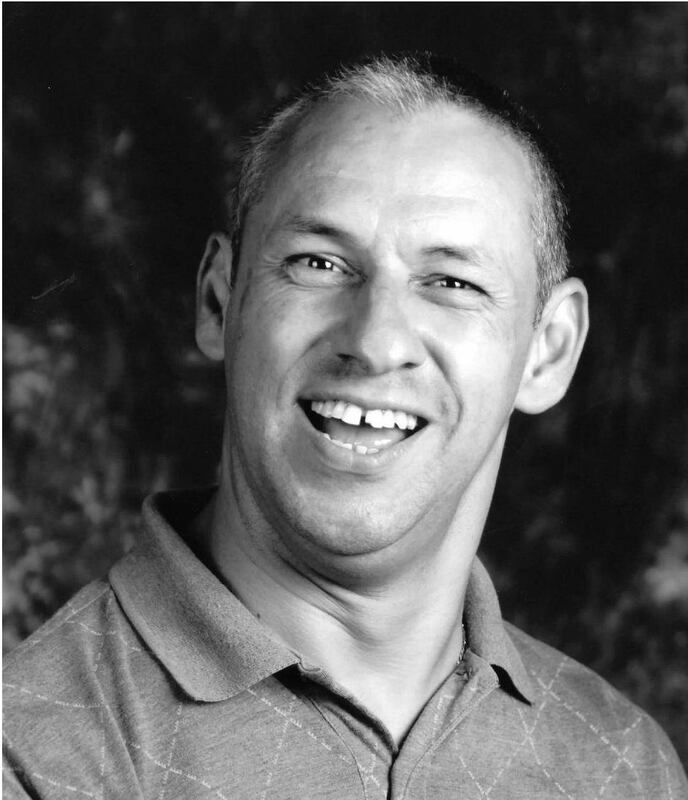 Thus, I set myself to build a new arts organization in town where total inclusion was the focus. To be honest, I did not want to take charge of this work because I knew what it entailed, but seeing that nothing was happening I knew something needed to be rebuilt. I began with a thorough self-analysis as well as an analysis of the current artistic situation in the San Diego region. After meditating on it for a while, seeing the pros and cons, I decided to invite some friends/colleagues to join me in building this new arts organization. So, at the end of 2013, CARPA San Diego was formed with the mission to create a space where Latinx artists could highlight their talent through theater, dance, music, and other artistic expressions, reaching out to the community in a non-traditional setting, with the clause in its values to include all people regardless of their race, ability, or sexual orientation. In the 1940s, 50s, and 60s, carpas (tents) were used in Mexico as a performing mechanism to bring entertainment to poor communities at a low cost. 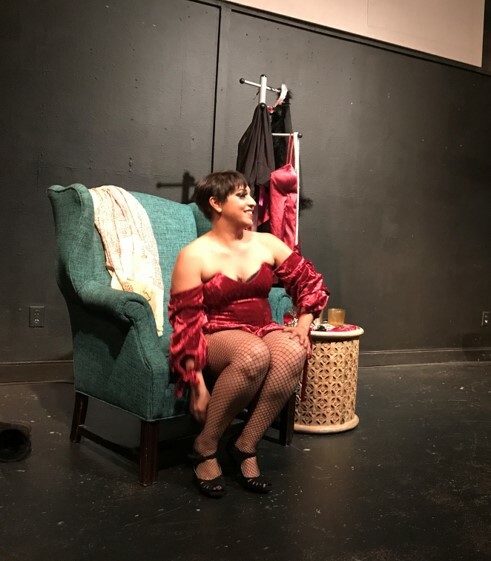 With this in mind, we started doing Latinx play readings for the community focused on social justice and change, at the Centro Cultural de la Raza. In 2014 we did a small, two-night scene festival where performing artists/groups where invited from Tijuana, San Diego, and Los Angeles to participate. Shortly after the festival was over, I had to make the choice to leave the Centro because of programming and funding choices being made there, not fitting the vision of CARPA. The following year, 2015, I was appointed Artistic Director of CARPA and took a leap creating a festival titled “REBELDES” (Rebels). Using a rented theater space for four days, we hosted six groups presenting full-length works: two from Los Angeles, two from San Diego, and two from Tijuana. CARPA San Diego was taking good shape building a name for itself. One of the shows presented in this festival was my new piece And He Became Man, narrating the story of Manuel, a Latino disabled man who questions his manhood by looking back at his life recalling major, influential events, asking, “What is a man?” Manuel takes the audience on his personal journey from the time when his parent migrated into the United States through his breakdown dealing with his brother’s death. In order to write this piece, I used my own life story to tackle many issues the Latinx community faces daily. It focuses on family values, migration, working in the fields, alcoholism, abuse, rivalry, and the questioning of identity from the perspective of a differently abled person. To reflect these issues on stage was a way to connect with the community. It was an opportunity for them to recall some of their history. In fact, several people have come up to me after a reading or performance thanking me for making them remember their past. The most significant moment I have experienced during this building process was after one of my performances in which most of my family attended. My younger sister approached me with tears in her eyes saying, “Sam, thank you, I didn’t realize how much I miss them” (referring to my parents and brother). It is moments like these of bringing people together and sharing my own experience that I value the most. The importance of using theater as an education and relief tool brings great significance for me as an artist. For my Latinx community, the border is not the physical wall, but the idea bestowed on us by white supremacist culture of not belonging or not being worthy of the space we live in – not acknowledging that most of the US southwest was Mexican territory to begin with. 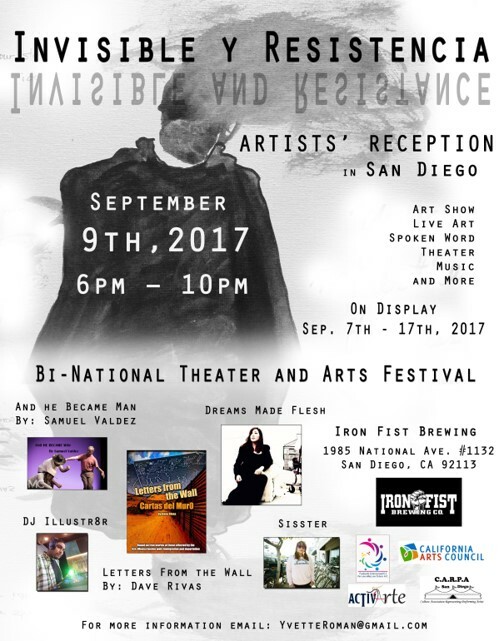 Opening reception flyer for the Bi-National Theater and Arts Festival 2017. Design: Yvette Roman Bañuelos. In 2017, CARPA took on a bigger challenge – collaborating with two organizations based in Tijuana, Mexico, to present a performing and visual arts festival on both sides of the border, breaking bigger ground with me as the organizer. Now, you need to understand – going into Tijuana as a disabled person/organizer is not an easy task, but with the help of friends and some connections I made through the years, I began the process. The festival’s theme was “Invisible and Resistance” to coincide with the political situation the United States is faced with today. The two organizations we collaborated with were: Fundación Internacional EC por una niñez con futuro A.C., a bi-national organization based in Tijuana/San Diego whose focus is to create an artistic space where children can build self-motivational skills by using art to stimulate their minds, and ACTIV-ARTE, a newly formed organization in Tijuana whose focus is to promote activism and awareness though the arts. It has been a real honor to work with many artists whose motivation is to create change in our border region by using art and positivism. I have felt very excited to see our regional artistic community on both sides of the border come together to form a bond that I know will inspire fruitful collaborations in the future, building stronger links between our two countries. In this festival, we presented over 60 visual artists in two galleries. La Casa Del Tunel art gallery in Tijuana sits right at the border line and was used in the past as a location to smuggle people across. After its shutdown from these activities, it became an iconic landmark and gallery where art is exhibited and performances are done. The Iron Fist brewing and art gallery in San Diego is located at the heart of Barrio Logan in an area where gentrification is happening. As part of the art show, performances also took place on the sidewalk outside of the bar. The significance of having creative spaces in these areas has never been so important. Using an arts festival in these two locations, we were able to construct a better artistic focus in the lives of many people who wouldn’t have had experienced it otherwise. Performance of Lou Best in “YO, LA PEOR DE TODAS” (Me, The Worst of Them All) at the Bi-National Theater and Art Festival 2017. Lourdes Best Rocha. Photo: Yvette Roman Bañuelos. I consider myself very lucky for the opportunity life has giving me to build strong connections, bring together talented people, and create space where artists from both sides of the border can dialogue about border/social issues affecting our region. Now, I do not want to come out as a person who is creating something new at the border. No. Festivals and cultural events have always taken place in both San Diego and Tijuana as a single identity or combined. The struggle to do away with the wall has been here for many years through artistic gatherings and performances. I simply consider myself an artist and cultural organizer who has a passion for the work I do. Living in Tijuana and doing most of my artistic work in San Diego, I am able to see the struggles of this third world country in several ways: the daily crossing at the border, sometimes spending two, three, four hours waiting to cross, seeing all the poverty and unjust situations people live in, white Americans crossing just to save a buck on their necessities, a reminder of economic inequality that privileges the US while denigrating the Mexican population, the struggle of identity of those living on both sides of the border sometimes not knowing how to identify themselves, or the force brought upon by the Mexican Armed Forces, police, or border patrol to create fear and distrust. The arts play a very, very important role in attacking these issues, giving a powerful voice to communities on both sides. 2017 was the time to strengthen ties with one another. I, as an individual artist with cerebral palsy who has struggled through many situations – trying to create my own space where there wasn’t any – I feel the necessity to continue creating spaces where art and activism can build changes in all of us as a community who struggles to still be heard and recognized for who we are. Being the lead in fostering new collaborations for the next art generation in my border region gives me great pride and satisfaction. By creating this bi-national festival new relationships were made with an interest for future collaborations in both sides of the border, as well as for the individual artists themselves. Though my passion and work, I believe that by using the arts to foster change, we as individuals will grow to make this world a better place for generations to come.